I feel like I live in a completely different house now that my daughter is mobile. I look at every piece of furniture, edge, and light socket to see if Lola will either try to eat it, climb it, or accidentally split her head open on it. And, unfortunately, I don’t realize which one of these options every.single.thing. in our house will be until Lola goes ahead and shows me. That’s why I felt like the skies parted, rays of sunshine poured out, and angels started singing when I learned about Baby Bodyguards. They are literally just that — bodyguards for your baby — providing safety services for families with babies and small children. This includes home babyproofing, certified car seat installation, and in-home CPR classes. Parents have enough to do without worrying about how safe their home environment is. They just come in, walk through the home with the parent, and install any necessary devices. Safety without too many restrictions. Kids should be free to explore, learn, and have fun. It’s their home, too. Education. It’s not just about installing safety equipment; we teach parents about what to watch out for and how they can easily identify and remove potential hazards. Every aspect of our service includes teaching parents new skills. Thoroughness. We know what small children are likely to get into, and we know how to take care of the things that are threats. Putting in a few outlet covers or cabinet latches is a false sense of security. We don’t want parents to say “I wish I had known about this danger” after an accident happens. The owners of the business credit their son for being their inspiration. But he’s not the crazy, increasingly-mobile toddler you’re probably envisioning. Dylan Weidlich (their son) was going to school in Chicago and became an EMT for Loyola University. He began working with several Chicago firefighters–providing CPR classes for expectant parents, becoming certified and installing car seats, and consulting with Chicago Children’s Hospital on car seats for post-operative children and children with other special needs. When he returned to Cincinnati, he wanted to continue working with families on safety issues. Dylan’s mom and dad joined him, and they found a family in Brooklyn that was doing this work as Baby Bodyguards. This Cincinnati-based business became their first location outside of New York City. 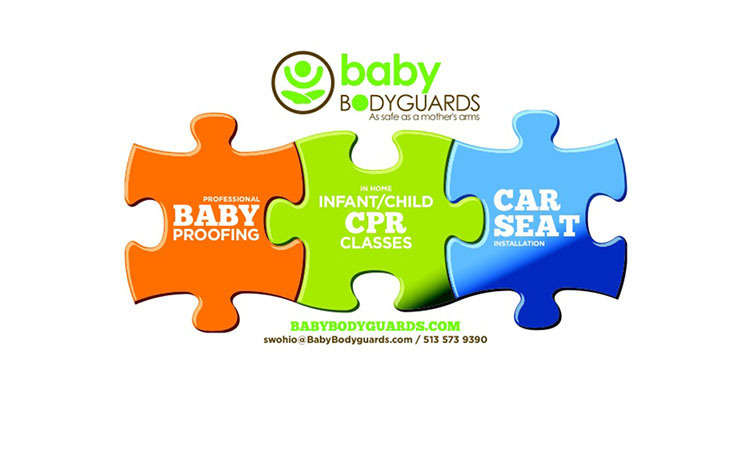 To learn more about them, visit www.babybodyguards.com and/or like them on Facebook at Baby Bodyguards of SW Ohio. Lots of great info — and new moms and grandparents (or friends and family, this is a great gift idea!) definitely look into this! Such an amazing idea if you have a little one who’s more mobile every day!